Well I remember the summer I learned the secret to creating a beautiful garden. Not just a pretty garden, but a breathtaking, heart-stopping, sensationally gorgeous garden. The secret is simple. Any gardener can put it to use. Results are assured. I’ll get to it in a minute. First it’s important I place the secret into context. It was spoken to me, matter-of-factly, by a woman in St. Paul whose terraced, backyard garden is so wonderful you never want to leave. The simple concept conveyed by her words was not new to my ears, except this time, finally, it hit me between the eyes with the force of a hockey puck. Her garden was one of thirty I visited that spring, attending to my part-time duties as regional correspondent and Minnesota garden scout for a national gardening magazine. My job is to find great gardens in the Twin Cities, then show them to the editor when he flies into town in late May. It’s not as glamorous as it sounds. If none of my gardens make it into print, I usually pick up an evening shift at Starbucks. Nearly half of the thirty gardens I scouted I had found the previous year on garden tours. In May of the following year I breezed through each again, to make sure the property hadn’t been sold and the garden replaced by rolls of sod at the hands of a new, young owner. Some gardens I ferreted out by driving slowly through the streets of the usual neighborhoods, gleaning clues from front yards (if the front of the property has a certain sizzle, there is sometimes a huge payoff in the back). A few of the best gardens were discovered when someone with a fabulous garden thanked me for my praise, then said, “If you think my garden is good, you really ought to see …”. For three weeks I traipsed from Wayzata to White Bear Lake, through Golden Valley, Bryn Mawr, St. Anthony, and Highland Park, looking at some of the finest residential gardens in the Twin Cities. Several are extraordinary, as beautiful as any private gardens in America. Fifteen made my final cut, including the terraced garden in St. Paul, and when my editor arrived we were off, visiting all fifteen gardens in just over six hours. During the entire process the big question I kept asking myself was, why? Why are all these gardens so special, so mesmerizing, so refined? Why do they lift the spirit and lower the pulse? And the tough question: Why are they so much more beautiful than mine? At the end of the day, the editor informed me I was to arrange for photo shoots at six of the gardens we’d seen. In three he was only interested in snippets of the whole – a rustic stone path, a curving yew hedge, a charmingly rotted bench. The remaining three he wished photographed in toto, including the aforementioned gardens in Golden Valley and the terraced job in St. Paul. A photographer was brought in, and the gardens photographed toward the end of June, when all the grand gardens you see in magazines are photographed. I’m getting to it. The photographer and I were shooting the terraced garden, a process which, after the initial set-up and walk-through, involves a lot of sitting around if you’re not the photographer. 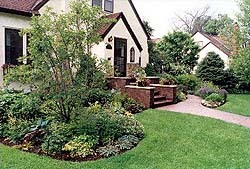 I started chatting with the mellow, friendly woman who had pretty much single-handedly created one of the most beautiful gardens in the Twin Cities. I asked her if she’d had any garden design training, and like most great gardeners, she hadn’t. She said that her garden had been a steep, grassy hill when the house was purchased, and that dividing it into three distinct terraces seemed an obvious choice if she was to do any gardening. She wasn’t keen on a lot of early spring bloom, because early-blooming plants take up precious space. She’d had a tree removed. There it was. There it was, just as I had read and heard a hundred times but never comprehended. 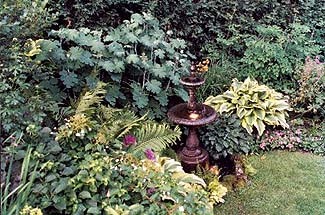 Not all of the gardens I had selected, but each of the six the editor had approved, shared one trait, regardless of size or style or palette of plants: Every plant, or the part you could see, stood out. Now I understood why the editor had so quickly dismissed several of the gardens I had presented him. Now I understood how he could glance at a Minnesota garden at the end of May and know immediately if it was worth his time to turn a corner or open a gate. He was looking at the plant combinations, looking at the leaves. If you garden, you’ve read the secret too. But was it expressed as the key element? Without leaving my computer I could turn to my reference shelf and in two minutes produce three magazine articles and ten books, somewhere in all of which will be written, “And remember, don’t just think about attractive color combinations when placing flowers, try to create interesting contrasts between foliage size and texture.” That’s too lame. People read that for years and never get it – myself included. I needed someone to hit me with a hockey puck: It’s the leaves, stupid. Yet plant catalogues ram photos of blooms in our face, so tightly cropped you don’t know what the leaves or other parts of the plant look like. Beginning gardeners get color wheels in every basic gardening book, and are dutifully instructed that colors across from one another on the wheel are called complementary colors, while colors adjacent to one another as said to harmonize. But where’s the foliage wheel? Where’s the wheel for shapes, sizes, and textures of leaves? I needed one. I grew plenty of perennial geraniums throughout my garden, and most looked stupid in front of whatever vaguely taller perennial lurked behind. In the gardens we photographed, I was seeing the same geranium, my plant, except its beauty was extended outward and linked to that of the heuchera beside it, the artemisia to its rear. Transfer the beauty from plant to plant, never let it drop, and a garden fills with magic. Hostas, when used, were placed singularly most often, and rarely lumped together, their large, oval leaves serving as background foil to whatever plant with smaller, more intricate leaves was placed in front. 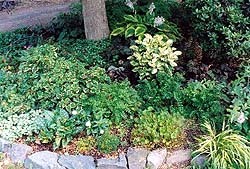 This principle is also why all the best gardens I saw used about eight different types of sedums throughout. 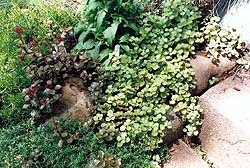 Sedums have wonderful variations in foliage size, shape, and color, the tiniest being used to link slightly larger plants any place quarters grew tight. And I finally discovered who buys all those Japanese painted ferns – and why. And color! Why hadn’t I been growing cotinus, stachys, alchemilla, many more varieties of heuchera, blue hostas, and variegated grasses? These and a dozen more plants provided contrasting foliage colors, none of them close to standard, flower-leaf green. Of course, color of bloom was not ignored – it was just secondary. Throughout the summer, these gardens presented plenty of color, without glaring clashes or snafus of hue. However, it was understood that the entirety of the plants would be visible from May to October. That bloom thing everyone gets so excited about, it comes and goes. That’s the year I learned the secret. It’s not about growing flowers. It’s about growing plants.